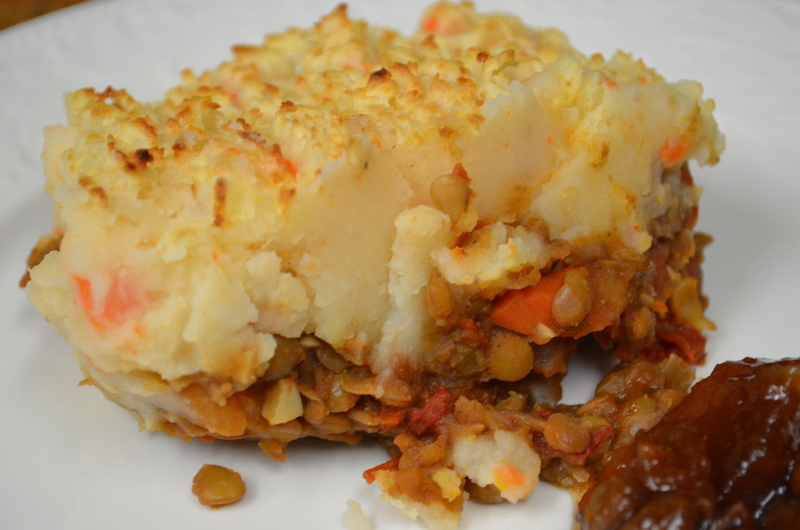 There’s something very homey and comforting about shepherd’s pie. I remember it from when I was a child; my mother made it, and the school sometimes served it up, too, back in the day when lunch wasn’t pizza and fries! Now, of course, I don’t eat the animal, but shepherd’s pie (sometimes called shepherdess’ pie) is still on the menu. I tend to think of green/brown lentils as being a bit too austeire and vegan for my brood to enjoy, but as has happened in the past, I was wrong, and the dish has gone down a storm. Daughter #2 had seconds while declaring that it really needed cashew gravy to go with it as she didn’t fancy chutney. Well, I’ll figure something wet to serve it up with next time. 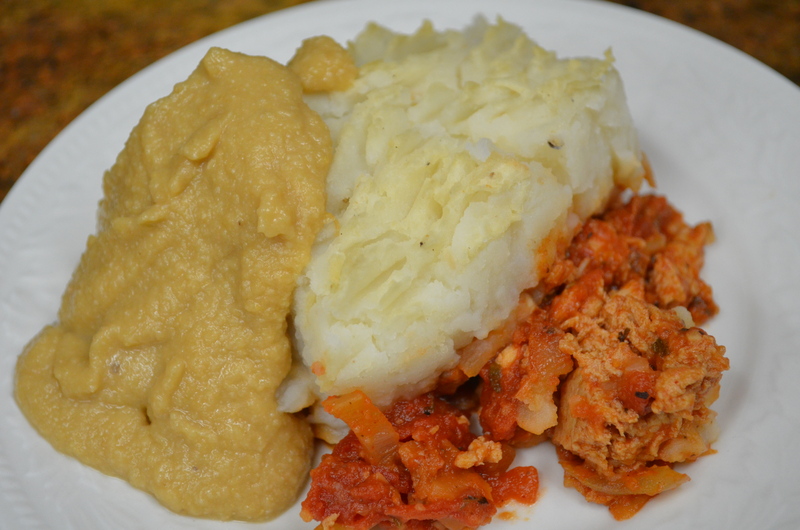 Last time I made shepherd’s pie, I made it with a meetoo filling (picture at the bottom of page), which was also good, but quite honestly, any of the thick stews that don’t rely on potatoes would work well topped with mashed potato. In the meantime, cook the onions and carrots/cauliflower florets in a frying pan with about 2 tbsp of wine to keep them from sticking. (You can use water, if you’d rather not use wine.) Add splashes of wine from time to time if the vegetables appear to be starting to stick. When the onions have softened (~10 minutes), add the garlic and spices to warm through for a minute, then add the tomatoes, cilantro, and salt and pepper. Once the lentils are soft, drain them. Stir the mixtures together, and allow to simmer gently, uncovered, for a few minutes to allow the flavors to combine, and the sauce to thicken. Peel and cut the potatoes into 1″ dice. Put the potatoes in a saucepan with lightly salted water to cover, bring to a boil, and simmer until soft (~10 – 15 minutes). Once soft, drain the potatoes, and mash by hand with with margarine and dairy free milk until soft enough to spread with a fork. Don’t use a food processor; the potatoes take on a glue-like consistency that isn’t appealing. Spoon the lentil mixture into a medium sized oven proof dish (e.g. medium lasagna pan). Drop fork-loads of the mashed potatoes onto the lentil mixture, then spread evenly with the tines of a fork. Place under a hot broiler/grill to allow the ridges to brown slightly. Serve hot with veggie side dishes and gravy or chutney. In the days before I was concerned about egg and dairy consumption, I loved quiche, but wouldn’t make it due to the calorie count. This recipe solves both problems in one hit, providing you don’t make the crust. 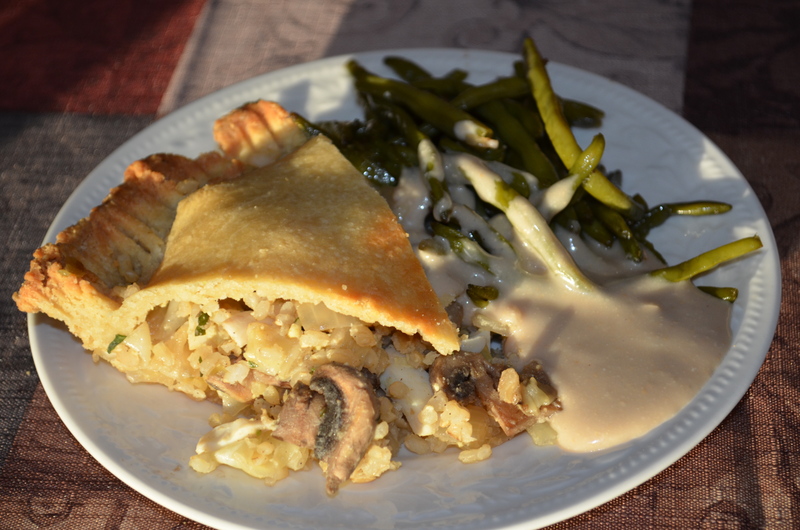 If you do want to make a crust, check out my recipe for the potato / almond pastry; there’s no need to apologize to your glutenous friends for this adaptation. 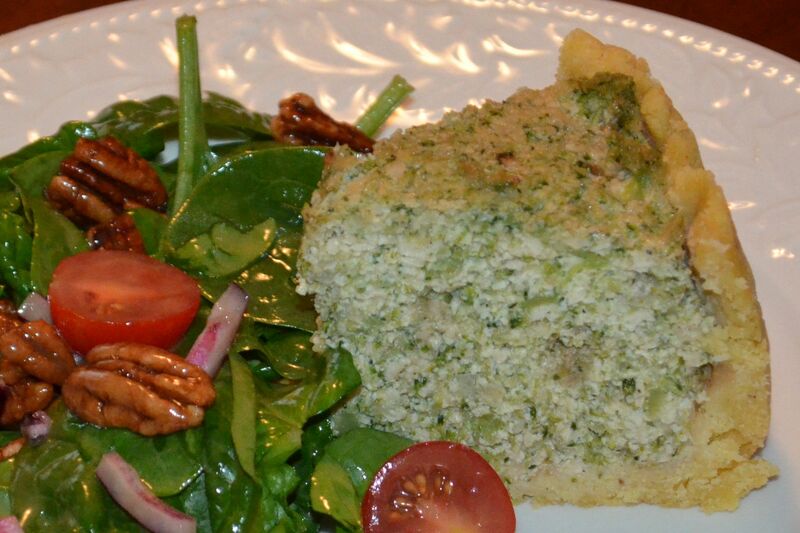 The only non vegan ingredient in this dish is the egg in the potato pastry. 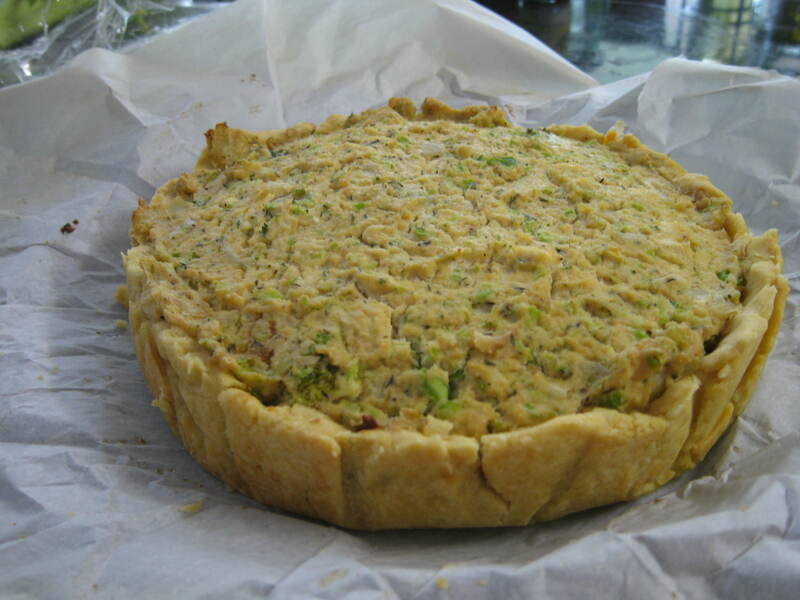 If you use vegan pastry or make a crustless quiche, the whole thing will be vegan. My husband likes the filling to have a large proportion of chunky vegetables; the kids don’t care, they like it any way it comes. Don’t be fooled by the ingredient list; the tofu custard is rich even though the calorie count is diet-worthy (providing you leave out the crust and don’t eat the whole thing in one sitting)! Soak the cashews in water for at least 1/2 hour. In a large cast iron pan, bring to the boil 1/4 inch of water, 1/2 tsp regular salt, the garlic, and the broccoli. Cover with a lid and steam until the broccoli is nearly cooked, then remove the lid and let the water evaporate. Add 1/2 the margarine and allow the broccoli to brown slightly. In a large cast iron pan, fry the onion in the rest of the margarine over a medium heat until browned. Line an 8” or 9” cake tin with baking parchment. 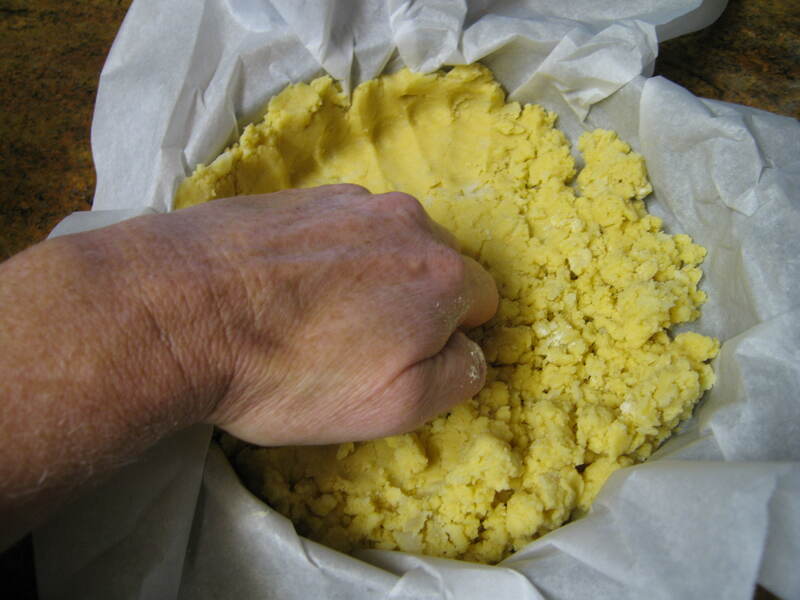 If you’re making a crust, crumble the pastry dough into the lined pan such that it is evenly spread, and then use your knuckles to press it into place and compact it. Drain the cashews and process in a food processor for 30 seconds. Make sure they’re pretty smooth before adding the tofu, and pulse again along with 1/2 of the broccoli, the onion, and the other ingredients until mixture is smoothish. Don’t over process or the tofu will be too creamy, and have too little bulk. Stir in the remainder of the broccoli, check for seasoning, and spoon it into the pie pan. Smooth the top, and bake for 40 minutes at 350F.